Need help promoting your business? Henley Graphics has several options to help you convert prospects to customers. We distribute brochures to over 100 high traffic locations throughout our 5-county region. 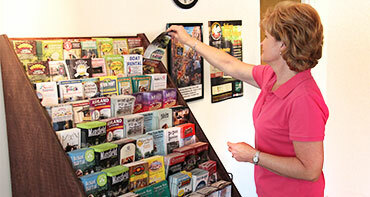 Check out our Brochure Distribution Services. Simply give us a supply of your brochures or let us print them for you and leave the rest to us. We’ll place your postcard , envelope or self mailer directly in the hands of potential customers while assuring you’ll get the best postal rates possible including Every Door Direct Mail Service (EDDM). Click here for more information. Henley Graphics can design, print and mail your direct mail project. From ballpoint pens to umbrellas, we’ll help you find eye-opening products that will keep your logo in front of potential customers all year long. Henley Graphics is an ASI© member. Upload your logo and see what it looks like on 1000s of promotional products. Read our easy to follow instructions. 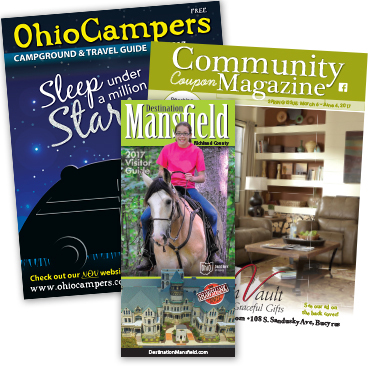 Contact us to see if your business may benefit from advertising in one of the many tourism related magazines that we publish including Ohio Campers, Mansfield & Richland County Visitor Guide and more. A partial list is here. We have Other Opportunites for Advertsing with our Area Maps, Hotel Room Directories and Placemats. Contact Henley Graphics today and we’ll be happy to discuss how to best promote your business, no matter how big or small your budget may be!